The standardised 2ha sign plot method provides systematically quantified data and is important to produce directly comparable data with that from the surrounding region, other sites, or over time. It involves searching multiple 2ha plots for bilby sign, for 25 minutes. In smaller areas, a density of 2-4 plots per 100ha, or alternatively less plots with supplementary linear searches, should be applied. As the project area size increases, plot spacing may be increased. If sampling independence is required, plots need to be spaced more than 4km apart. Plot locations need to be distributed to include all suitable bilby habitat and a range of fire ages. The Commonwealth Department’s (2011) survey guidelines on Bilby search protocols and effort are vague and do not provide sufficient detail to undertake an adequate survey for Bilbies. if, they are present, then to provide an indication of their density and location. For an environmental consultant to say Bilbies are not present, when they are present (Type II error), not only damages the consultant’s reputation (e.g. James Price Point assessment) but probably more importantly, results in a project that is not adequately assessed by environmental regulators (State and Commonwealth) and leaves a population of threatened species without adequate management. Graham recently attend a training program on statistical techniques to measure detection conducted by Dr Darryl MacKenzie of Proteus. Based on the knowledge gained on this course he worked on a side project of developing a quantified approach to determine the probability of detection of Bilbies using 2ha search plots. The resulting method allows anyone undertaking a search for Bilbies to determine how much survey effort is required to have the necessary confidence to say the Bilbies are not present, when they are not present prior to field work. Presuming that the detection probability is high (i.e. you can find evidence of them when they are actually there), then the most obvious approach is to search the entire area. This will guarantee that they are found or not found and minimise Type I and Type II errors. However, if there is a sampling approach that will enable a surveyor to search a proportion of the area, and with a high probability conclude they are not present, then this will save both effort and costs. It is assumed that the sample of 2ha plots is done randomly and the hypergeometric distribution is an appropriate tool to determine probabilities and sample sizes. For this discussion it is assumed the area to be investigated is 1,000ha (i.e. size of a small mining pit in the Pilbara). It therefore has 500 non-overlapping 2ha plots. In Figure 1, Psi = occupancy (i.e. if Psi = 1, then only one of the 500 plots contain evidence of Bilbies) and it is assumed that all signs of Bilbies have a detectability = 1 (i.e. if there is evidence of Bilbies in the 2ha plot, then it will be found on every occasion). So, using the hypergeometric distribution, when Bilbies are only present in 1 of the 500 plots, and 1 of the 500 plots is randomly searched, the probability of determining their presence is 0.002 (i.e. 1 in 500). If 10 plots are searched then probability of determining presence increases to 0.02, and if 100 plots are searched, the probability of determining presence is 0.2 (i.e. 20% chance of finding a Bilby if they are present in the 1,000ha). 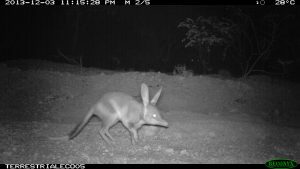 If Bilbies are abundant, then the number of 2ha plots to be searched is significantly reduced, unless the abundance of diggings, scats and burrows is being used as a proxy measure for relative abundance. 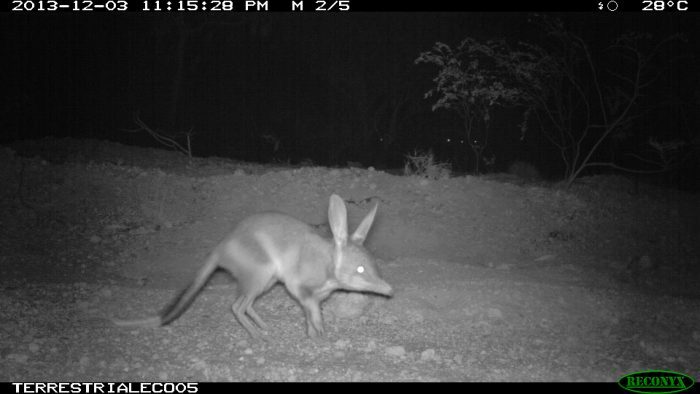 Based on the ecology of Bilbies and many years surveying for them in the field, it is likely that if Bilbies are present in the 1,000ha, then they will be present in more than 1 of the 2ha plots. Therefore, if 5 of the 500 2ha plots have signs of Bilby, and only one plot is searched, the probability of determining their presence is 0.01. If 10 plots are searched, then probability of determining presence increases to 0.096, and if 100 plots are searched the probability of determining presence is 0.67, and so on. The same method can be applied for higher densities of Bilbies or smaller and larger search areas. What was obvious from using this technique is that if Bilbies have a detectability of 1 (which they don’t), and only one plot contained evidence of Bilbies and a zoologist followed the DBCA guidelines of searching 2-4 plots per 100ha (or 20-40 plots per 1,000ha), they would have 95% or 92% chance of not finding evidence of Bilbies in the 1,000ha (Type II error). To the trained observer, Bilby diggings, tracks and scats are reasonably detectable, but to the less experienced, they can easily be confused or missed if there are only a few of them. Bilby burrow entrances are large, so if they are present and the search is thorough, then they should be found. However, in sandy desert areas tracks can disappear quickly if it has rained or windy and scats can be covered in sand. 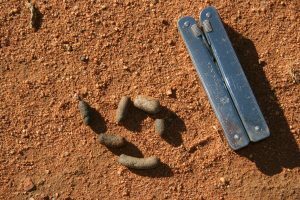 In the harder clay soils in the central Pilbara, tracks are often not obvious, and scats are easily weathered by summer thunderstorms or not seen in the small pebbles. The detectability of finding Bilbies, if they are in an area is therefore lower than 100%, even for a trained and experienced observer. In the calculations for the data in Figure 1 we have presumed that detectability is perfect (P = 1), but if it is less than 1, then the slope of each of the lines decreases and a greater number of 2ha plots will need to be surveyed to achieve the same probability of determining their presence. A more reasonable detectability for Bilbies is 0.7-0.9 depending on the substrate and the environmental conditions. So, if we wanted to be 99% sure of concluding no Bilbies are present (i.e. zero plots contain evidence of Bilbies), with a detectability of 0.8, then having searched all 500 plots, you can only be 80% confident that they are not present. The use of a detection dog will significantly enhance the probability of detection and reduce the survey effort and thus the cost. For example, Cristescu et al. (2015) used a trained detection dog to search for koala scats. Koala scats can be difficult to locate in the leaf litter under the trees occupied by koala. Their off-leash detection dog consistently out-performed human-only survey teams. The dog found 100% of scats found by the human teams, and was 153% more accurate (i.e. it found more scats than the human teams) and it was 19 times more efficient. 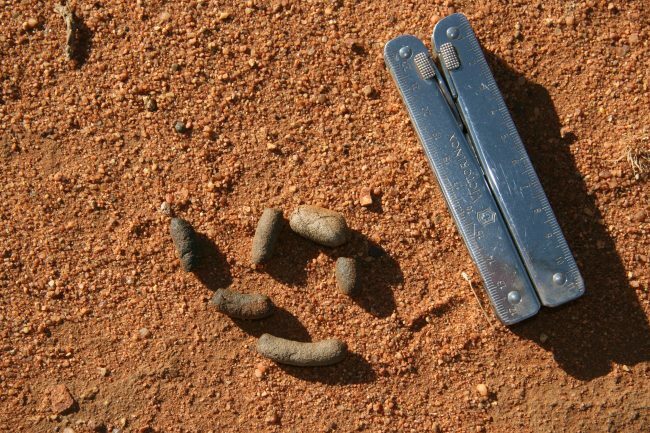 Bilby scats are similar to Koala scats and will be buried by sand, rain and leaf litter, and they will be difficult to find with a human-eye but will still be detectable by smell and therefore found by a detection dog. Adherence to the guideline provided by the DBCA is highly likely to result in a surveyor / consultant concluding that Bilbies were not present in an area when they are actually present. This has the consequence that regulators will be provided with incorrect information and Bilbies will not be protected or managed during the subsequent development. If you wanted to be 99% confident that bilbies were not present, you would need to search 495 2ha plots and based on the guidelines each search is 25 minutes per plot. You would therefore be searching for about 198hrs in this one small area. If you presume that your detection rate is 100% (i.e. P=1) and you want to be 99% confident that you have not detected a Bilby when it is actually present, then you’ll need to sample 495 of the 500 2ha plots, and if you only wish to be 95% confident that Bilbies are not present, then you will need to sample 475 2ha plots. If you don’t believe your detection rate is 100%, perhaps it is 80% (i.e. you’ll miss 20% of the evidence), then you only have an 80% chance of finding Bilby evidence when it exists having sampled 495 plots, your probability of detecting that Bilby evidence drops to 79.2%, and having sample 475 plots your probability of detecting Bilby evidence drops further to 76%. If you used a detection dog and had a detection rate of 90%, then your probability of determining their presence in a single plot increases to 89.1% when 495 plots are searched, and to 85.5% when 475 plots were searched. This detection probability method allows consultants, surveyors or researchers to calculate the survey effort necessary to find Bilby (or any other threatened fauna) prior to going into the field. It also allows regulators or the public to determine if the survey effort employed by the people undertaking the searches was indeed sufficient to determine if the species were actually present when the conclusion based on the field survey effort was that they were absent. We thank Dr Darryl MacKenzie of Proteus for his advice and assistance in providing a suitable statistical method, and reviewing the content before it was posted. Cristescu, R. H., E. Foley, A. Markula, G. Jackson, D. Jones, and C. Frere. 2015. Accuracy and efficiency of detection dogs: a powerful new tool for koala conservation and management. Sci Rep 5:8349. Department of Biodiversity Conservation and Attractions. 2017. Guidelines for surveys to detect the presence of bilbies, and assess the importance of habitat in Western Australia. Perth. Department of Sustainability Environment Water Population and Communities. 2011. Survey guidelines for Australia’s threatened mammals. Canberra.